The chair of the All-Party Parliamentary Group into brain injuries has branded football “absolutely preposterous” for its ongoing refusal to introduce temporary concussion substitutes. As reported on Tuesday by The Telegraph, the International Football Association Board will defy suggestions from Premier League doctors and Fifpro, the world players’ union, to introduce ‘concussion bins’ this year amid fears inside Fifa that they could be exploited for potential sporting advantage. Rugby has a Head Injury Assessment protocol which allows players to be temporarily removed for up to 10 minutes so that they can be assessed while the game continues. A three minute assessment window was brought in before last summer’s World Cup in football but numerous doctors regard this as insufficient to make a proper assessment. Led by chair Chris Bryant, the All-Party Group for Acquired Brain Injury has called for a single concussion protocol across sports and has particular concerns about football. “My impression is football is only making progress because they are terrified of litigation,” said Bryant. “I think that is a terrible mistake. Research funding is absolutely minimal in this field. “It is absolutely preposterous that, although the Football Association and Premier League have made some strides in recent years, Fifa still do not allow subs to come on, as happens in rugby. You need subs to come on because you need 10 minutes to do a proper assessment at the side of the pitch. You can’t do it in three minutes. 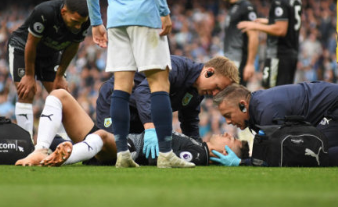 It is understood that Ifab is waiting for various medical studies to be completed before making a decision on temporary concussion substitutes in the future and a spokesperson said that it was “aware of the ongoing discussion about this topic”. Dr Michel D’Hooge, the chairman of Fifa’s medical committee, implied that managers would exploit concussion substitutes for tactical reasons when he outlined his opposition to the idea. “I hope you don’t believe that this would be used rightly every time,” he said. Other doctors have told The Telegraph that player welfare must override this concern. Dr Willie Stewart, who is currently researching the prevalence of dementia among former footballer – a study jointly funded by the FA and Professional Footballers’ Association – has said that it is “unacceptable” that football still does not allow significant time for an assessment to take place. There were a series of worrying incidents at last summer’s World Cup when even Fifa’s existing protocol – that play should stop for three minutes to assess head injuries and a minimum five-day rest following a concussion – were not routinely enforced.